Discitis, or disc space infection, is an inflammatory lesion of the intervertebral disc that occurs in adults but more commonly in children. Its cause has been the subject of debate, although most authors believe it to be infectious. The infection probably begins in one of the continguous end plates, and the disc is infected secondarily. Severe back pain that begins insidiously is characteristic of the disease. They rarely have an elevated temperature and their white blood cell count is frequently normal. However the erythrocyte sedimentation rate is usually increased. Lateral radiographs of the spine usually will reveal disc space narrowing with erosion of the vertebral end plates of the contiguous vertebrae. bone scanning may be helpful in localizing a lesion that is difficult to diagnose clinically. Some bone scans are falsely negative, so the diagnosis of disc space infection should not be excluded simply because the bone scan is normal. Magnetic resonance imaging (MRI) seems to be helpful in identifying a disc space infection. The appropriate treatment of these lesions has been the subject of controversy. Most authors recommend plaster cast immobilization, a treatment that seems to be effective by itself in many cases. Some authors think that antibiotics also should be given because the condition most likely is an infection of the disc (the organism involved is frequently Staphylococcus aureus). In treating the lesion in children, a biopsy is not usually necessary. A biopsy may be indicated in adolescents or adults, especially if drug abuse is suspected, because of the possibility of organisms other than Staphylococcus aureus being present. 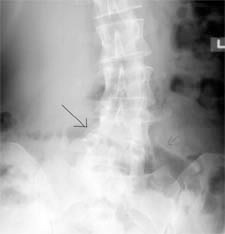 Vertebral osteomyelitis is infection in the vertebral body itself. It may be caused by either a bacteria or a fungus. 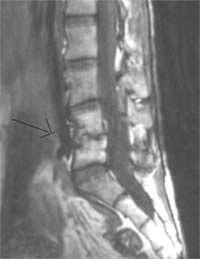 Bacterial or pyogenic vertebral osteomyelitis is more common. Its presentation is different than a disc space infection. It may represent infection elsewhere in the body that has seeded the spine through the blood stream. These patients are systemically ill, exhibiting increased temperature, white blood cell and erythrocyte sedimentation rate. The average time from onset of symptoms to definitive diagnosis has been reported to range from 8 weeks to 3 months. The onset is usually insidious, with back pain the most common symptom. The pain is localized at first to the level of the involved area, with a gradual increase in intensity. The pain eventually becomes so severe it is not relieved by complete bedrest. Usually neurologic signs are not present until late in the disease course when there can be destruction and collapse of the vertebral body. Other symptoms variably present include chills, weight loss, dysuria, photophobia, and drainage from a wound or incision if there has been prior surgery. The causative agent is usually Staphylococcus aureus. Long term antibiotic therapy is required, usually six weeks of intravenous antibiotics sometimes followed by oral antibiotics for another six week period. Surgery may be indicated, particularly when ongoing vertebral destruction is identified. Although rare, typical diseases such as tuberculosis of the spine should be considered when faced with spinal infections. This is more common in underdeveloped countries. Epidural abscesses are infections that form in the space around the dura, the tissue envelope that surrounds the spinal cord and nerve root. These pockets of purulent fluid may surround the spinal cord and/or the nerve roots and generate enough pressure to affect neurological function. The symptoms can be subtle with (paresthesis - a sensation like pins and needles) or mild weakness. Back examination should be performed for evaluation of asymmetry, paravertebral swelling and tender vertebrae and careful neurological examination should be performed. The same diagnostic tests are employed with erythrocyte sedimentation rate being the most consistent abnormal laboratory value. The white blood cell count and blood cultures are useful as baseline parameters. Plain radiographs are not helpful. Magnetic resonance imaging (MRI) is the study of choice for further evaluation. 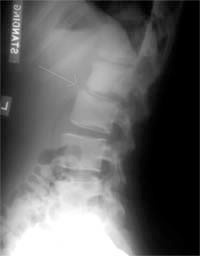 This single study will define spinal cord compression and the status of the spinal cord, determine the presence and extent of the abscess, provide a diagnosis of co-existing osteomyelitis, and exclude a drainable paraspinal fluid collection. The indications for surgical decompression of the spinal cord would be an increasing neurological deficit, persistent severe pain, or increasing temperature and white blood cell count.